I spotted the first 2014 calendars on sale yesterday (it's August guys!) 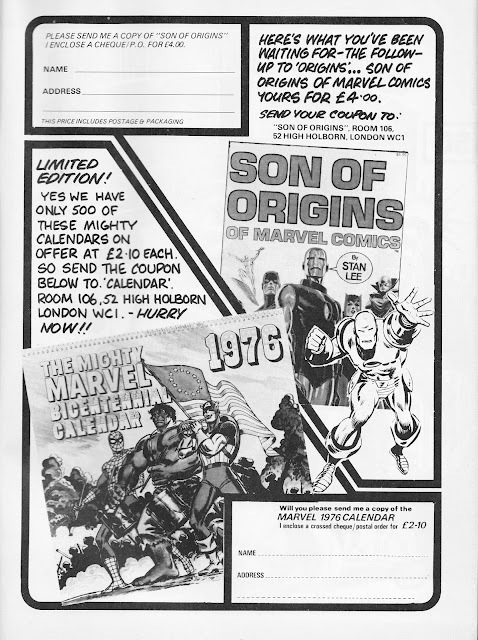 so I went scurrying back to the STARLOGGED digital vaults and unearthed this scan, from January 1976, giving British Marvelettes a chance to mail away for the MARVEL BICENTENNIAL CALENDAR 1976 (better hurry, by the time they've processed and despatched it... it'll be March already!) and Stan Lee's legendary tome SON OF ORIGINS OF MARVEL COMICS. I remember that calendar very well but at the time I didn't know about the picture it was based on. The bicentennial was quite big news in the UK - I was 10 and I knew all about it , in fact I knew who President Ford was before I knew who the British PM was ! Talking of calendars on sale in August - my mother once bought a box of mince pies in August !